Cast iron is one of my favorites because it lasts forever (unless you drop it, in which case it will break – along with your foot). Roast the slice of butternut squash wrapped in foil, in a 350 F oven for about 20-30 minutes or until soft but not mushy (you can also use leftover cooked squash). Allow to cool, cut into thinner slices and sprinkle with little salt. Heat the oil in a large, heavy cast-iron skillet , add the garlic and the thinly sliced zucchini. Cook for about 5 minutes and discard the garlic.
? ?In a large bowl, whisk the eggs with the milk, salt and cheese if using. Pour into the skillet, add the slices of pumpkin (or butternut squash), sprinkle with the peppercorn t and transfer the skillet into the preheated oven. half way through the cooking, tp with the fresh oregano if using. Cook for about 6-7 minutes (more if doubling the amounts), or until the eggs are set and the frittata is golden and just slightly browned. Cut into wedges and serve warm. It also has a way of enhancing rustic flavors, and it’s perfect for eggs! 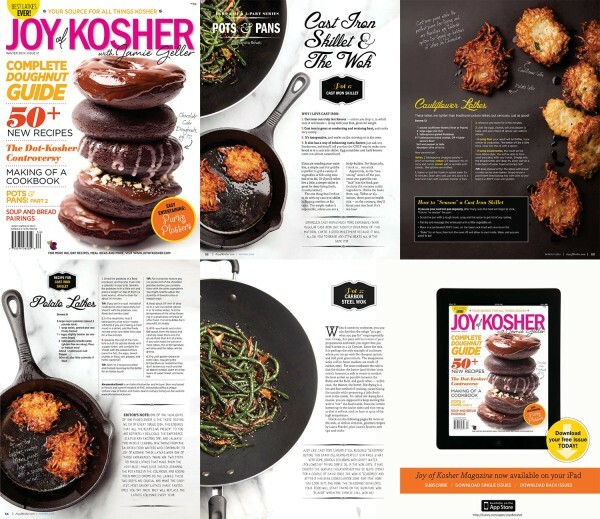 I loved your feature in Joy of Kosher, I can’t wait to try your recipes! I also love my cast iron pan, it is the best! Wow! Your photography is so beautiful. It makes food look like art. I have a butternut squash in the house right now so I think I’ll have to make this very soon! I too love cast iron. Does your article have tips on cleaning the cast iron skillet? Pam, the best way to clean a cast iron pan is always rinsing the pan with hot water right after cooking – just don’t allow the food to sit and harden!!!. To remove burned scraps, you can scrub with coarse salt. never use a harsh metal brush or sponge, or detergents with chemicals (cast iron is absornent!) just a few drops of a mild natural dishwashing soap every once in a while. If the pan develops rust on it, only then you scrub it with steel wool but you will have to reseason it. o make your skillet nonstick, you have to “season” it by coating it with cooking oil and baking it in a 350° F oven for an hour or so. Dry it with paper towels, et voila. Wow! That is beautiful. I’ll have to try it. I adore butternut squash! are yu going to post about it, Emilie??? I love butternut squash and this is so simpe- perfect for a light fall dinner! This looks delicious. When I printed it out there were 2 extra blank bullet points under ingredients….I noticed some ingredients are missing on the recipe…how many cloves of garlic? How much milk and cheese? And what do the question marks mean in the recipe…hopefully something isn’t missing there. Please let me know when this is fixed as it looks so beautiful and I”d really love to try it! Ale – it is always so wonderful to have you in our magazine – I read your articles and learn so much. 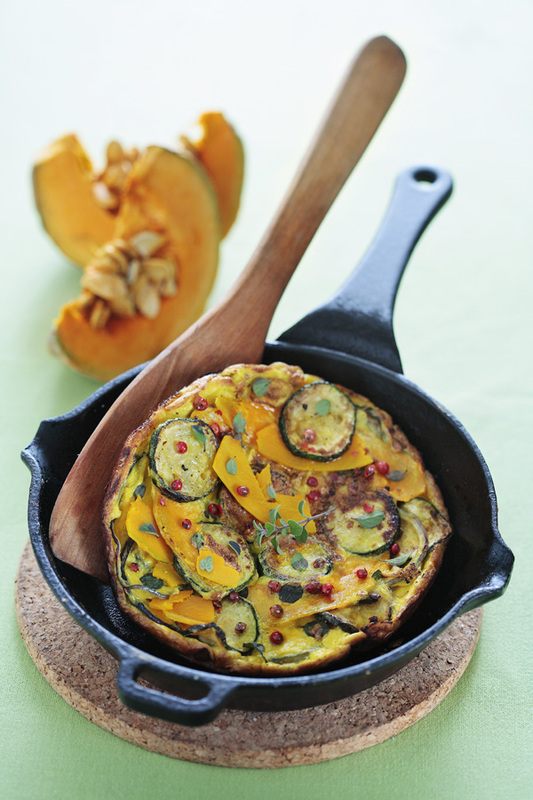 And I love frittatas – but never mad one with butternut squash – thanks for the inspiration. The peppercorns add such a punch of color! Beautiful! Beautiful as always. One day I will make a frittata. Now this is something truly original—summer and winter squashes in the same dish. I’ve got to try this soon. Absolutely gorgeous and so simple to make too! We eat frittatas a lot, have to add this to my list. I love frittatas, but always keep them simple (boring). I have to try your recipe! I also need to invest in more cast iron, loved your article! I love your frittatas and I love this series of articles.